After the sugar coma I have been in the past two weeks I didn’t think I could look at another sweet for a very long time (EVEN if it IS the baking season!). I mean with cupcake testing, my birthday and Thanksgiving all within days of each other, I have more than eaten my share of sugar! But I had to come up with at least one more baked good for the Hodgson Mill “Have a GRAIN Holiday” Baking Campaign (*see below recipe*). With overly ripe bananas taunting me on my counter, I figured I would do a new twist on banana bread. If it is not obvious by all the versions of banana bread on this site, which is a flavor I never get sick of (especially since my Mom had some of her famous banana bread at Thanksgiving and I did not get near enough!). Eric, on the other hand, wanted cookies. He’s been wanting cookies (acting like we NEVER) have them. So then the light bulb went off. 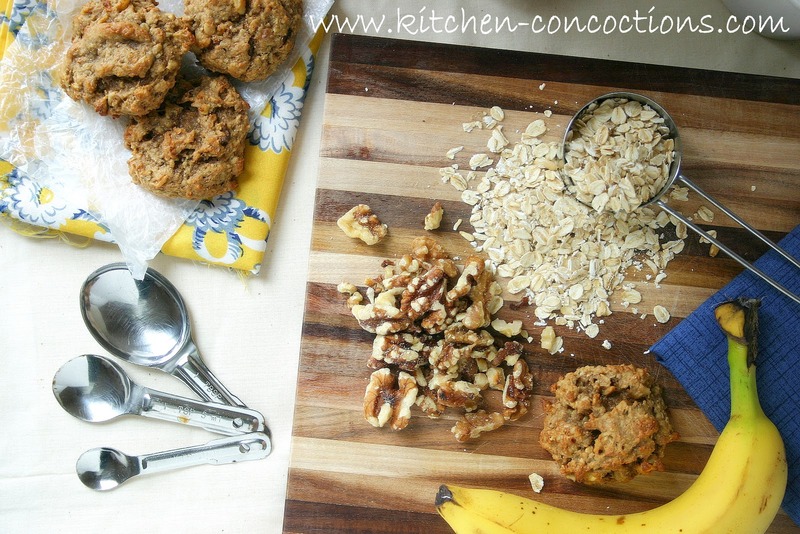 How could I use those darn over ripe bananas to create a cookie that well tasted similar to banana bread. Well by golly folks I think I did it!!! 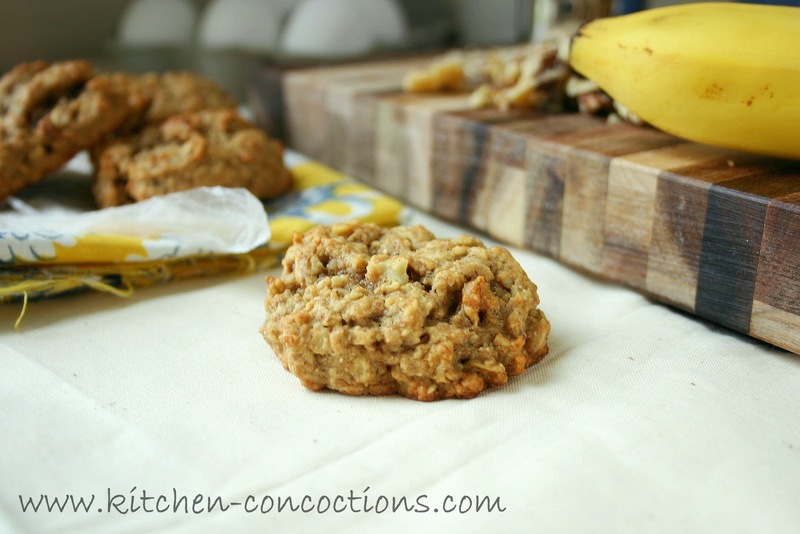 These Banana Nut Oatmeal Cookies are the absolute perfect cross breed of a cookie and banana bread. 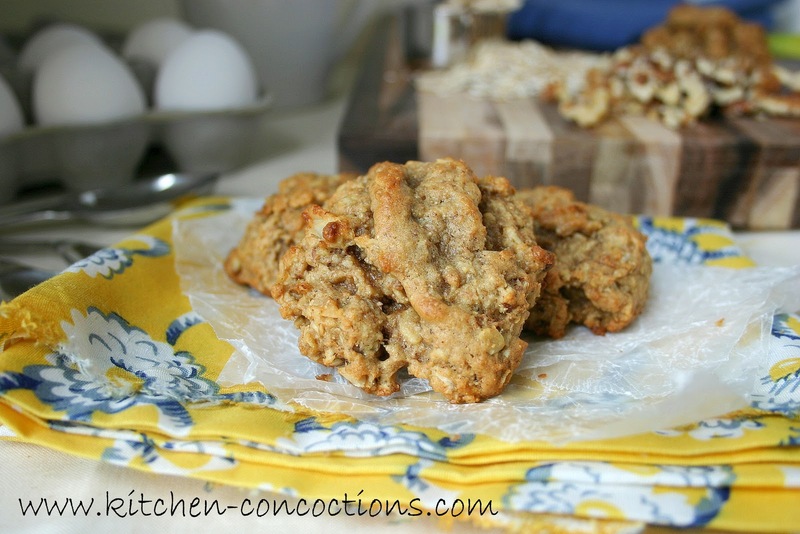 Rich in banana flavor (just like Mom’s), soft, moist and slightly chewy in texture; this is an amazing cookie! Especially if you are a banana bread lover! A few notes and suggestions: First don’t over bake these cookies. In my oven they were cooked to a slight golden brown yet still soft and moist on the inside at 10 minutes. And while the ingredient list and directions seem rather long, with multiple steps, each step and ingredient is crucial to the overall glorious outcome of these cookies. So yes, do toast the walnuts, roast the bananas and brown the butter, this is what makes these cookies delightfully unique. Oh and yes, this recipe uses whole wheat flour, if you are a whole wheat flour in desserts skeptic, don’t be! I promise you’ll find the whole wheat flour just adds to the complexity of these cookies and is something else I demand you do! Seriously the best cookie I have had in a long time! Preheat oven to 425 degrees. Line baking sheet with foil. Place bananas, in their peel, on foil lined baking sheet. Roast in preheated oven for 10 minutes or until dark brown in color. Once roasted, remove pan from oven and let bananas cool enough to handle. Once cool, peel bananas and mash bananas in a small bowl with a fork. Discard peels and foil. Meanwhile, heat 3 tablespoons of butter in a small sauce pan over medium heat. Carefully cook butter for 6-7 minutes or until golden brown in color. Once butter is browned remove from heat and set aside. In a large bowl, cream together remaining 3 tablespoons of butter and both sugars. Mix in the vanilla, egg and brown butter; mixing until thoroughly combined. Mix in the mashed roasted bananas. In a separate bowl, stir together both flours, baking soda, baking powder, salt and cinnamon. Slowly add flour mixture to wet ingredients, mixing until combined. Stir in oats and walnuts. Drop dough (it will be wet in appearance) by tablespoonfuls on baking sheet. Bake in preheated 350 degree oven for 10 minutes, or until tops begin to brown slightly. Remove cookies from baking sheet and cool on wire racks. **Note: To toast walnuts, place on baking sheet in 400 degree oven and bake, stirring occasionally, for 5-8 minutes, or until toasted. Or heat a small sauté pan over medium-high heat. Add walnuts to pan and cook for 5-8 minutes or until toasted, stirring occasionally. *Reminder: Click here to enter the Hodgson Mill “Have a GRAIN Holiday” baking prize back giveaway on Kitchen Concoctions. You can also enter to win a Hodgson Mill Baker’s Holiday Gift Pack by clicking here and heading over to the Hodgson Mill website. You can also click here to print a $1.00 off coupon for any Hodgson Mill flour or cornmeal. 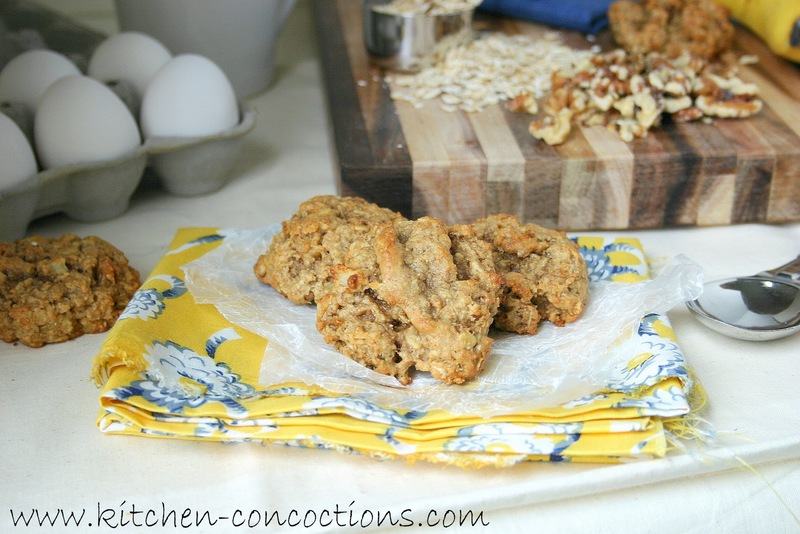 I'm linking this recipe to Taste and Tell's cookie recipe link up party! not sure if I missed something, but the ingredient list doesn't seem to show the quantity and types of sugars called for in the recipe. I didn't figure this out until 2/3rds of the way through making these. I ended up using 1/2 Cup brown sugar and 1/2 Cup granulated sugar and the results were great. This recipe is awesome. Thank you! P.S. chocolate chips added to the dough does not take away from the recipe's awesomeness. @Bert- Yikes! I can't believe I missed the sugars when I typed this up! I apologize for the inconvenience. I have edited this recipe to include the sugar. I actually used 1/2 cup brown sugar and 1/4 cup granulated sugar because I used extremely ripe bananas and they are always so sweet. I am glad that despite my typo this recipe turned out great for you! And I agree, chocolate chips would be a totally awesome addition to these cookies! Enjoy!